While RVing we don’t think that someone will try to steal from us. Why would they when we would happily give them anything they need fro a cup of coffee, tools to repair the rig, or even cash if they needed it and were in a bind at the moment. Although RVing engenders a healthy and welcomed attitude of trust among fellow RVers, there is always a possibility of risky situations. Thinking ahead, awareness of your surroundings and a bit of precaution will help you avoid most problems. These few tips will keep you and your family and RV out of harms way. While on the RV road we reserve or take advantage of both parks and campgrounds with amenities and utilities OR we may be boondocking or just dry camping at certain spots on the way to our destination. Stay vigilant, not in the super paranoid way, but pay attention to your surroundings and what is happening around your RV. Remember that storage room locks on an RV are very low security so consider buying better ones if you store anything of value in them. Close the blinds or shades when you leave. You may even want to close them in the evening when all of your activities inside your illuminated RV can be easily seen by your neighbors. Bring small items inside or lock them up, especially when you leave. Get to know your neighbors. People are more inclined to look after each other (and each other’s stuff) when they know them. You may find yourself boondocking when you travel from one campground to the next which means you need to be a little more careful. Be careful where you park. If you are catching a few zzz’s look for something a little busier like a truck stop or a parking lot. Stay somewhat close to civilization in case there is a problem, help is not too far away. Stay vigilant and keep an eye on your surroundings (see a theme here?). Try to avoid the shady parts of town. Every city has them and if you are in doubt, ask the campground manager, friendly locals, or talk to a police officer. Try to not look like a tourist. It automatically puts a target on your back. Avoid flashing valuables and cash around. Make sure you have a good cell phone for travel and keep it charged in case you break down. Roadside assistance is essential if you spend any amount of time on the road. Then again, many plans have free lockout assistance so it is pretty handy when you are in the campground as well. Keep your RV or towing vehicle in top working order with regular maintenance. Don’t let yourself get too low on fuel. Keep your propane tanks full. If you encounter drivers with road rage don’t engage them. Let them pass, don’t respond, and try to get away from them then notify the police. If you are off RVing that often means that your home is left all alone – and vulnerable. The tried and true home protection tips are still relevant today. Ask a neighbor to keep an eye on your home while you are gone and ask them to pick up your newspaper, collect your mail, and get any packages that may come while you are away. Put your lights on a timer so they come on at certain times. Park your car in the driveway as opposed to the garage; it gives the appearance of someone being home. Finally, good RV insurance that covers your rig and belongings is absolutely necessary. That way if anything does happen you are covered. That's a topic for a whole other post. 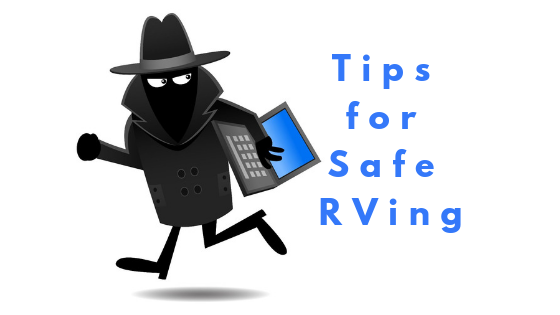 What are your RV security tips? Tell us in the comments or over on our Facebook post. Teri Blaschke is the RV Park operator of family owned HiddenValley RV Park in San Antonio, TX and writer of the park blog “A Little Piece of Country in San Antonio.” Teri contributes to various other blogs with a focus on either travel or social media and how it relates to the outdoor hospitality industry but her passion is serving the RV travel community by providing a memorable RV camping experience and growing the Hidden Valley RV family. 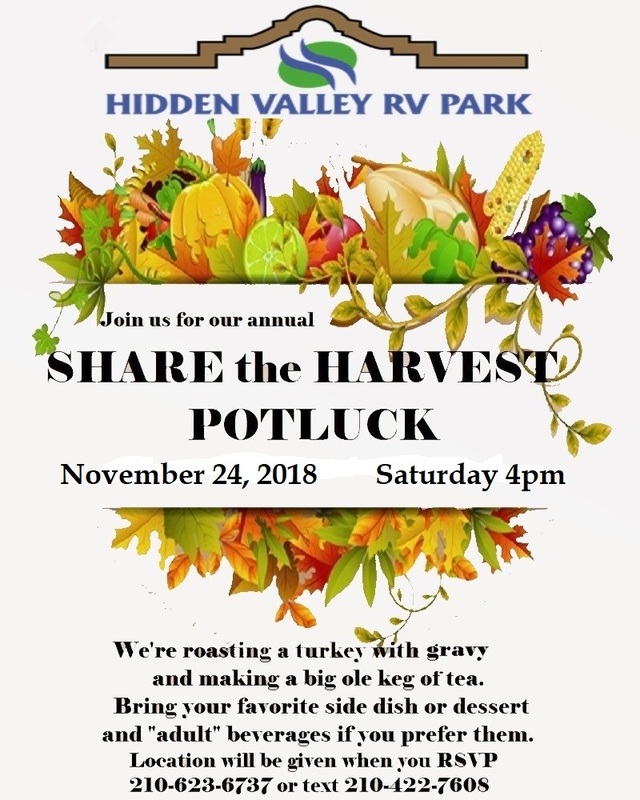 Connect with Teri on Google+, Facebook, Pinterest and Twitter@HiddenValleyRV. Problems Sleeping in the RV? You've probably heard the scuttle about the effect of LED lights on our sleep patterns. According to the website LIVESCIENCE.com, the body's biological clock works in rhythms that are set by the amount of light and dark the body is exposed to. This is called the circadian rhythm. Circadian rhythms control the timing of many physiological processes. They determine sleeping and feeding patterns, as well as brain activity, hormone production and cell regeneration. A little techie but sounds pretty serious. For some time doctors and others have told us to keep cell phones, appliances, modems, routers, etc., away from our sleep area. 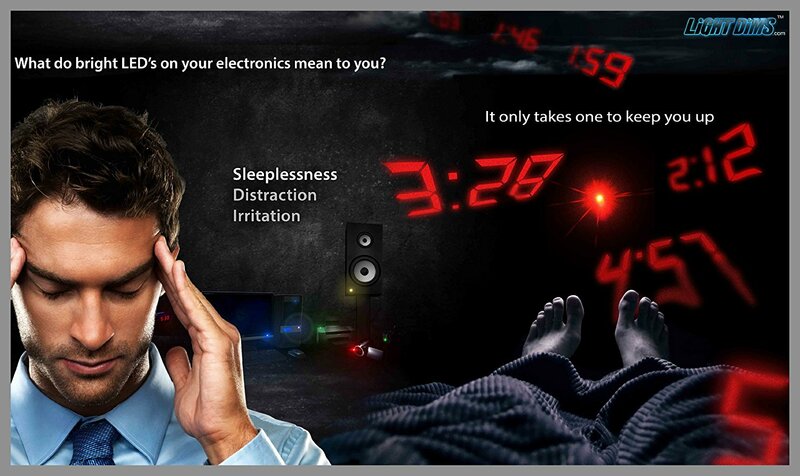 Whether you ascribe to the idea that they are sleep inhibitors or not, most people prefer to sleep in darkness. While some of today's RV's are so large that these LED lit devices can often be far enough away from where we sleep, often our devices are in view, especially due to the brightness which seems to pervade from one end of the RV to the other. Many switches and gauges in RVs also sport these bright lights. My cell phone and wireless charger alone make such a laser light show that I at first thought a police car with flashing lights was outside and reflecting on my wall. I've used a towel thrown over the offending light...somewhat unsightly but it usually blocks it out. Then I used black, electrical type tape cut in appropriately sized pieces. Blocks well but leaves a bit of residue on the light cover or switch. Then I read on a FB group about LED Light Dims. These pre-cut shapes are reusable and they come in original strength and the black out edition. I found that they are not really an adhesive at all buy more like the old "colorforms" we played with as kids, a sort of self stick film. I also found that this product is available in sheets that you can cut to fit what you want to cover. I used it on my phone glass and was still able to use the phone touch screen. 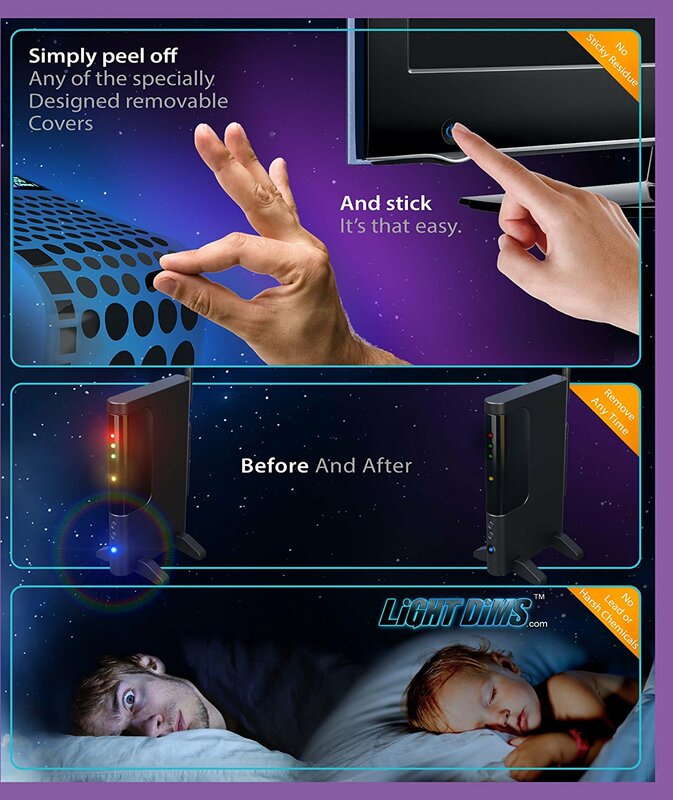 So, if this problem of bright LEDS has caused a sleep issue for you, look for LED Light Dims in your local RV Supply or feel free to hop over to Amazon at one of the product links on our post to check out the product details and order right away. If you've found some other ingenious RV tips please share them with us in the comments. As the mass exodus has already begun from the colder, northern states to the more moderate climate of Central and South Texas, many RVers are planning their itineraries. There's park reservations to make, festivals to plan for, exciting and historical attractions to visit and special events to include. While some travelers plan routes through the Midwest, desert areas or the beautiful Florida beaches, Texas always does things in a big way. Over the next few posts we'd like to share some of our local, favorite "must do and see's." So you have plenty of time to plan, the first special event we'll cover is held in early spring when many are just about ready to head back to their Northern homes. The month of April is host to one of the most popular festivals in the Alamo City — Fiesta San Antonio. Fiesta runs April 19-29 this year! Annually the Fiesta Organization begins way in advance to put together an art competition which will result in the official Fiesta Poster. Here you see the current years winner. 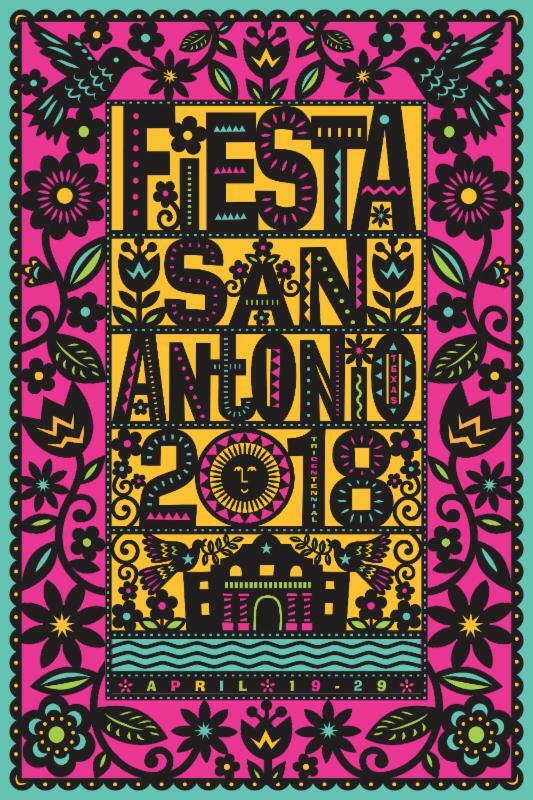 Chosen for it's vibrant color and it's Mexican Folkart feel, this poster is extra special due to 2018 being the Tricentennial of San Antonio. Notice the tricentennial recognition in the "1" of the 2018. Not only is it the poster, it will be echoed on all the Fiesta products for this year, from T Shirts to marketing materials. So what's it all about? The streets are filled with music, confetti and celebrations galore. But is it all just another excuse for a party or is there a history behind the most celebrated San Antonio holiday of the year? It started as a one-parade event as a way to honor the memory of the heroes of the Alamo and the Battle of San Jacinto. According to Fiesta San Antonio organizers, in 1891, a group of ladies decorated horse-drawn carriages, paraded in front of the Alamo and pelted each other with flower blossoms. The parade was organized to honor the heroes from the battles of the Alamo and San Jacinto and was formerly known as The Battle of Flowers Parade. Within a few years, more events were taking place on or near April 21 including a carnival, balls and coronations. Fiesta has taken place every year except for 1918 during World War I and 1942 through 1945. Since 1959, the Fiesta San Antonio Commission has reinvigorated the celebration, planning activities for 100 local nonprofit organizations and the more than 75,000 volunteers. According to Texas Public Radio, Fiesta medal history dates back to 1946, when the Texas Cavaliers created little coins to take to hospitalized children. "They had special coins — the king’s coin — and they’re just little half-dollar sized coins. But in 1961 Joske’s department store provided the Cavaliers with a little cardboard piece that had a punch-out in the center where you could insert the coin. And then it apparently had a hole in the top of it where ribbons could be inserted through those. And so you could then hang this around your neck. After 1971 a few other Fiesta organizations started producing Fiesta medals, but it was little more than an aside among other Fiesta festivities. So how exactly did they become such a Fiesta phenomenon? A Lt. Col. Childers, was stationed at Ft. Sam Houston, and was looking for ways to generate support and friendliness between the public and the military. He came up with the idea of making a Fiesta-themed, military-looking medal to hand out during events. It was a hit! 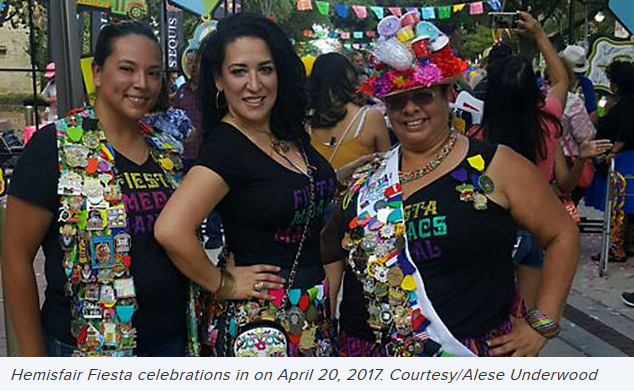 Since then, every radio and television station, business, agency and organization in the San Antonio area goes to great expense to design and manufacture a "pin" to show their support of the Fiesta celebration. Fiesta goers make it a goal to get as many of these medals to don all over their Fiesta outfits, covering their hats and making heavy the large medal filled sashes many wear. You can purchase medals and Fiesta products to feel a real part of the festivities. Both the official Fiesta Store and their webstore, https://www.fiesta-sa.org/shop-home/ make it easy. Feel free to search our blog for other "Fiesta" articles to get photos and more info. remember though that 2018 is the San Antonio Tricentennial year so this event promises to be the best yet. So, will your travels include an April visit to San Antonio? If you have any questions or want to share past Fiesta experiences with our readers, please ask and tell in the comments. One of the joys of camping is the opportunity if affords you to get away from city life, and with it, the opportunity for stargazing. Hidden Valley RV has very little artificial light, making viewing the night sky much more satisfying. For those of us who enjoy stargazing but lack an encyclopedic knowledge of constellations, apps like SkyView can be a huge help. If you’re anything like me, sky-interested but not particularly sky-knowledgeable, SkyView is a great tool for your stargazing experience. 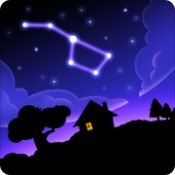 The app is easy to use and extremely helpful when stargazing. After installation, point your phone or tablet at the sky and the app will identify the galaxies, stars, constellations, planets, and satellites over your location. 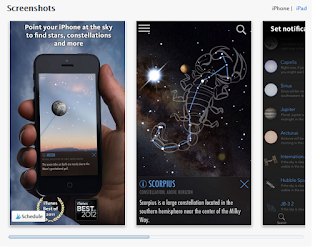 The app also includes detailed information and graphics for each sky object. The app automatically updates any trajectory changes the object you’re tracking may make, and the Sightings Engine provides a list of new sky object sightings each day. See developer Terminal Eleven’s website for more information on SkyView and it’s sister app, SkyView Satellite Guide! There is a free and paid version for both Android and Apple. A great website for the current months astronomical events and how to best view them is StarDate. It has lots of great info, in advance, about the planets, moons, etc. that are converging in your location. Then you can make a “star date” to be in an opportune spot at the right time to see the most activity. What a fun way to teach yourself, your children, your students, or your friends about our wonderful universe! How do y’all view the earth’s ceiling? Tell us in the comments about your favorite app or other way to learn about and watch the skies. Yes, we've all heard the axiom "The only good snake is a dead snake." Unfortunately it is so far from the truth. While not knowing if a snake is venomous or not could instill a goodly amount of fear in us when we see one, that is the best reason to learn more about them. Very few people LIKE snakes but they are a fact of life in many parts of the US, especially South and West USA. Hidden Valley RV Park has even been graced by an occasional reptile of the long and slender type. The Center for Disease Control and Prevention estimated that 7,000–8,000 people per year receive venomous bites in the United States, and about 5 of those people die. http://www.cdc.gov/niosh/topics/snakes/. Incidentally, Florida has the most cases. Two main groups in the US, coral snakes and pit vipers. The Corals hail from Texas to the Carolinas with the exception of the Arizona Coral which inhabits its name state and New Mexico. These pretty babies bite with small teeth instead of fangs. 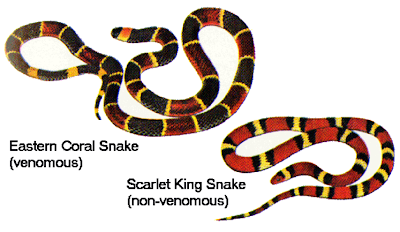 Although there are snakes that are similarly colored, a coral can be identified by the alternating bands of red, yellow and black stripes, the red always touching the yellow. 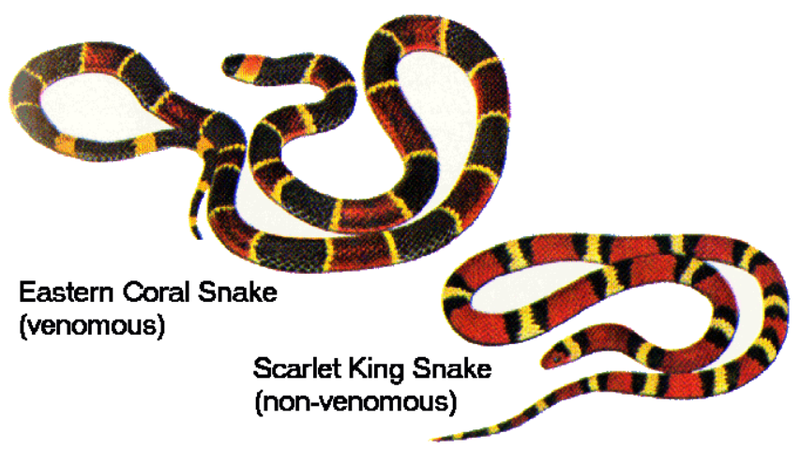 The very similar Scarlet King Snake is nonvenomous. The axiom "when red meets yella it's a dangerous fella," is one we've employed here at the valley. 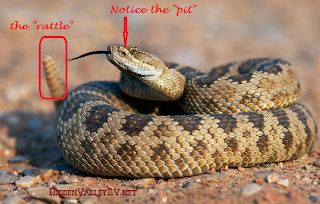 Pit Vipers include, rattlesnakes, water moccasins and copperheads and they can be found anywhere in the US. Their name comes (I always thought it was because they liked pits) from the tiny "pit" between their eye and nostril. The pit makes it so they can detect heat enabling them to find prey at night. These more drab looking reptiles have retractable fangs which shoot venom into their prey or an unsuspecting human. 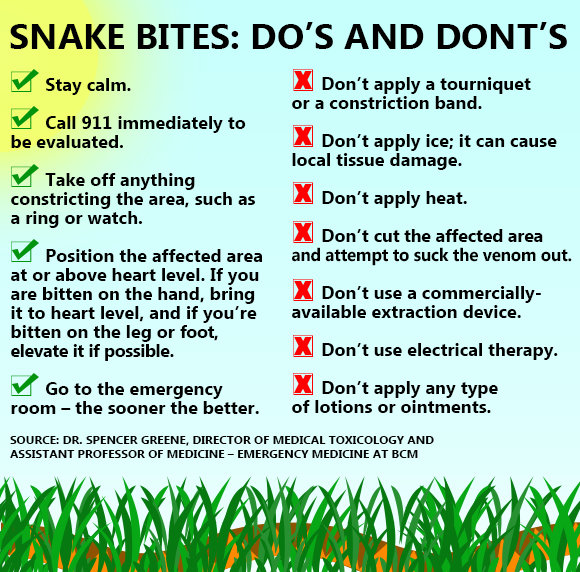 There is the possibility of receiving what's commonly called a "dry bite" meaning one without venom. Bites from old and small snakes have less venom. Some have felt that venom from smaller snakes is somehow more poisonous or dangerous however recent studies have refuted that belief. Notice the "Pit" and the "Rattle"
Bites from both types can range from hurtful to debilitating to death dealing if not treated immediately. Symptoms can range from a merely a stinging pain to inability to breath due to swelling to affecting the brain and spinal cord. Just as with other allergic reactions the site may become swollen or bruised looking and bleeding could exist. Even with a small amount of venom you may experience faintness or numbness of the tongue. These are evidence of shock and need quick attention. When you get medical attention, a doctor will use and antivenom serum that is produced by injecting a small amount of serum into an animals blood (usually a horse) which then causes their immune systems to produce antibodies to combat the venom. The antibodies are then harvested from the animal in a concentrated form so that it can act quickly to neutralize venom in a person bitten by a snake. Many persons can have an allergic reaction to the serum itself and are usually given epinephrine to counteract the allergy. 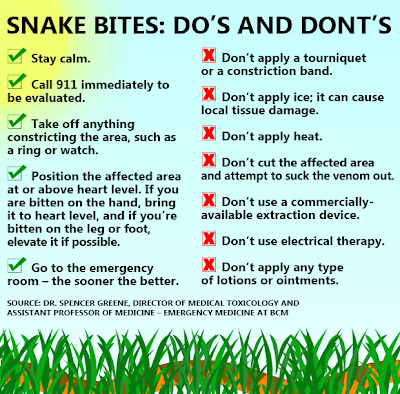 Can Snakebite Be Prevented? How? Especially are these tips essential for RVers who are involved in gateguarding since the sites are in virtual snake playgrounds. Whereas some may go by the adage "the only good snake is a dead snake," there are at least four reasons to just let them be. Snake venom, when extracted, is used for various applications including treatment of breast cancer as well as stroke victims and it can also help in heart attack treatment. Venom is also used in the medicines of blood pressure. So, in all, snake venom is very helpful for mankind. It'd be wise to think twice before hating any snake. If you have any snake experiences or other tips for our outdoor enthusiast readers...drop us a note in the comments. Look forward to your feedback. A Testimonial For RV Testimonials or Why Bother To Write Reviews? Regarding reviews or testimonials, they are most often given when we are unsatisfied with part or all of a customer experience. A normal transaction and even those that exceed our expectations, often go unreported. Now us full time RVers are a different sort and we love to share our hidden and new found RV places but for all the RV travelers and weekenders out there...don't hesitate to take a few moments and summarize your overall experience at each stop on your RV journey. We like to include many attractions in our reviews as well but leave at least a few words about every Park we visit, no matter how small or large. Imagine yourself traveling in an unfamiliar state or city and searching online for an RV Park to rest for the night and seeing scores of them. 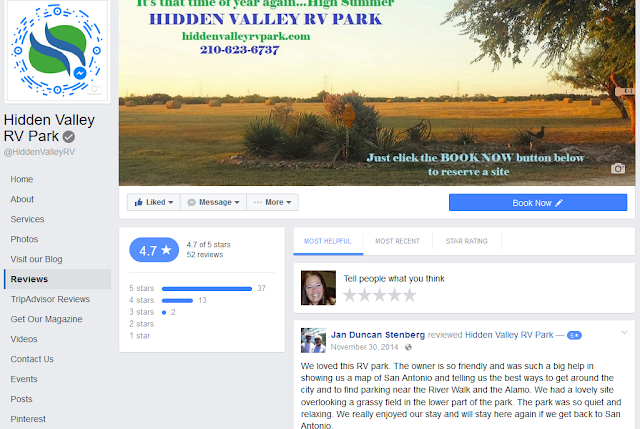 If you have signed on with RV Park Reviews, a forum for reviews administered by RVers themselves, you could know in a moment which one is liked by RVers like yourself. Yes the Park website itself can be invaluable to choose the amenities you want and the features you need but what if your RV peers have the restrooms rated badly or they post the pool as being top rate? If those features are important to you, their comments and reviews can be very helpful in making a decision that will greatly improve your stay in that area. Other RVers also post helpful hints on review sites like an easier route to a particular park or and entrance with better clearance, invaluable info if you've got a 13" high fifth wheel. There are also survey sites that many parks affiliate with that can be of value to campers and parks alike. Any RV park is always looking for ways to improve and learn what their guests are thinking. A wide variety of questions are combined into reports that give parks letter or number ratings that can benefit RVers when planning their travel parks or on overnight stays. For many, the easiest way to spread the word or voice your thoughts on ANY place is Facebook. Since you're on there anyway, search for the facebook page of the place you're at and look for a review tab on the left side of their page. (Note: that's where the tab is now - it used to be on the top and next week it could be on the bottom so just hop around the page till you see it.